Italian pioneer of wireless and Nobel Prize winner. 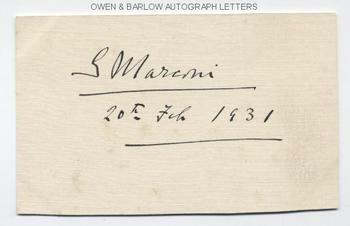 Autograph signature, dated in his hand, 20th February 1931, on post-card. A fine, large signature. Approx 5.25 x 3.25 inches. One or two very slight foxing spots, else fine. The autograph of Marconi is a comparative rarity amongst modern scientific AUTOGRAPHS.